Is there an electrical product that I can set to a constant temperature to help rise bread in our cold house? I've had success with a work lamp, set far enough away to not over-heat the bowl. I did have to remember to turn the bowl every once in awhile to keep the heat fairly even. I can't even imagine what the microwave might have done to the dough! Eep. You're thinking of the mythical "proofing box". I have read about them but never seen proof (ha ha) of their existence. Consider this approach, but my god, 85 seems way too hot, unless you're in a hurry. I'd probably turn the oven on and set the dough on the stove top where it'll catch the heat from the oven vent. all ya gotta do is cover yo dough well with plastic wrap (or a damp towel) preheat your oven and put the bowl up on top of the cupboards by the ceiling. s'about 5-10 degrees warmer up there than the air by your thermostat. That won't really keep the temperature controlled and constant, though. I filled the bathtub about 1/3 full with HOT HOT HOT water, put the (covered) dough in the bathroom and closed the door. When I went in there to check on it, the room was indeed warmer than the rest of the apartment, the heat was nice and moist and the bread looked great. Since I have the world's cheapest stove (no light) and we keep our apartment pretty chilly due to astronomical gas prices, this was a decent alternative. Also, everyone's bathroom has/should have a door, so the heat is confined to that room. is there a way to save yeast from week to week in a way that makes it usable in the next loaf or ball of pizza dough? 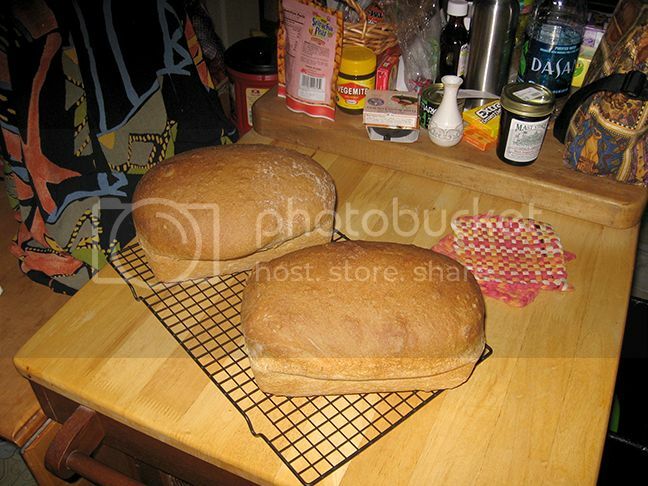 i want to try baking bread again. i did it a few years ago and didn't like it. it always came out too dense. does anyone recommend any books about bread? Beard on Bread by James Beard and The Bread Bible by Rose Levy Beranbaum are my 2 go-to bread books. thanks! i have heard of catching wild yeast but i always think...yeast, in the air, does it come off people's/animals' bodies and stuff? weird. i'm doing no-knead bread today. i'll probably go to the library tomorrow to find some books. Yeasts are everywhere. You can just get some grapes (untreated, probably from a backyard vine or a vineyard is best) because they are natural yeast harbors and use them to make a starter. k, i am planning on doing this. doesn't it catch pollution and stuff? cat hair? fuzz? yes, put it someplace draft-free and relatively cat-hair-free if possible. Also, some wild yeasts taste bad, so be prepared for that possibility. i've been looking at the bread bible and now i remember why i gave up on bread the first time. it's impossible? there are way too many things to worry about! i think my oven is really miscalibrated too. i don't think i can control any of the things that need to be controlled to do a good job at it. but i am making an injera/sourdough starter so i can make fake injera. it's amazing, i just put about equal amounts flour and water in a plastic container and sealed the lid. it smells like stinky feet. It does sound impossible, but I keep at it by reminding myself that people have been baking bread for ages and ages without any fancy business and even if it doesn't turn out perfect, it still generally tastes really really good. I hope your starter works well! I've had reasonable success with bread lately. What I'm doing is buying those premixes that are for bread machines, but making the bread by hand and baking it in the oven. It seems the mix has some added things in the flour that help - salt and preservatives I suppose (citric acid or something?). I used to be able to buy bread preserver powder but I cant find it anymore. I'm moving house next week and hoping I'll now have a functional oven ie one with a thermostat not set to KILL. Then more baked goods will arise! Bread improver! Thats what its called. there was an article in the nytimes a couple of years ago abt some (apparently) amazingly easy to bake bread, i never tried it, but if yr having trouble maybe you could give that a go??? oh yeah my dad is a huge fan of the nytimes no knead bread recipe i think. i will see if i can find it - he emailed it a while ago. harbl, i am super impressed by your adventurousness! injera at home! wow! i am interested in high-protein grains so i would like to find some teff (too expensive to ship or i'd just buy it on the internet) but i think i'd have to go to dc to find an ethiopian grocery store. might look for buckwheat somewhere instead. If there's a grocery or health food store near you that carries the Bob's Red Mill brand, have them order the teff for you. I've had really good luck with all the BRM grains. Are you going to grind it yourself or are you looking for flour? i wish i could grind it myself! someday, when i have more money and more storage space i will. so i would like flour. i keep meaning to go to the tiny store down the street to ask about ordering too. for now i have some whole wheat flour i want to use up though. Teeny told me ages ago (some other thread in here) about making chapatis when I was looking for things to do with whole-wheat flour. The proportions are 1 of water to 2 of flour (to start, might need more flour if the dough is too sticky), salt (like 1/2 - 1 tsp per cup of flour), a splash of oil to make the dough easier to work. Stir it all together (just use your hands if you're okay with that), knead and work the dough until it is elastic, divide into small balls and pat into thin flat rounds. Heat up a skillet over a medium flame for 10-15 minutes. Leave each round in the hot skillet until nicely browned on one side, then flip to brown the other. i did make chapatis, with milk instead of water. they were good. but my starter seems to have died already? i might try feeding it one more time. not sure what i did, i don't think the water was too hot or anything. does this require a cast iron skillet? i would imagine so. i found my dad's email. in it, he attaches the sullivan st. bakery no-knead recipe, but also this follow-up with some recipe tweaks/tips. i'll probably try it again sometime, it just annoyed me. like the entire internet says it's so great but i couldn't make it work. dad says he altered timing - 18 hours for first rise and 2.5 hours for second, per bittman's advice. maybe that would help? i will try this recipe. i haven't made bread in ages. that's exactly what i did! i think the oven temp is messed up. i turned it lower than it recommended because when i made pizza it was too crispy. the moistness suggested the temp was too low, but the bottom was pretty burnt. the crust was extremely thick, too. i know it's supposed to be but this was not fun to eat. i could make mini boules but then i'm sure the baking time would be all messed up and i'm not skilled enough to adapt that. I'm strange I guess, b/c I love kneading the dough by hand. I do mix it initially with a dough hook in my Kitchenaid, but turn it out and knead on a floured board set on the dining table to finish it. Also - chapatis, tortillas, naan, other flat breads - I think cast iron is always best. It heats up well over a medium flame (just leave it for 10-15 minutes to heat up and even out) and it retains heat really well. i love when you get to punch it. i'm with jaq on the kneading: meditative and gets yr blood pumping. plus if ya do it every week like me then when you shake hands you can crush 'em with yr kneading power! I've barely started exploring this site, but it looks like a fantastic resource. I made the Italian Bread recipe today (starting with the preferment last night) and it turned out great! The loaves lost a bit of volume as I transferred them from the work table to their cooking surface (the back of a sheet pan w/parchment), but I think that was for the best, because the degree of airiness and fluffiness inside was exactly what I'd hoped for. Brushed them with water just before putting them in the oven, and had a pan of hot water in the oven as well, and they produced a nice crust. My oven isn't big enough to bake both loaves at once, so the 2nd loaf gets an extra 40 minutes to rise under a damp towel. maybe just put some salted butter on it? It's barely edible that way, and completely inedible without. ugh ugh ugh this is disgusting. Amazing what a bit of salt brings. yea that italian bread recipe is mad boss. i did it yesterday and it makes wicked sammy bread, nice crust and totally soft and chewy underneath. also will soak up tomato juices (r whateva) in yr sandwich without breaking/tearing. totally had to use more than 5c flour to make the dough tho. at the end 2 nice perky loaves, and even worked well in the regular loaf pan. last night i grabbed the mason jar with the "sourdough culture" in it and was happy to see bubbles and expansion. i did as rose levy beranbaum instructs and removed about half of it to the rubbish bin, then dumped in a scant 1/2 cup of regular unbleached flour and 1/4 cup of water, and stirred it in. this morning it had already doubled in volume. I guess this is working . . . Exciting! Does it smell yeasty? does it taste sour but not bitter? i don't know jaq it kinda smelled like wheat mixed with cedar or something last night. and this morning i did not have the expansion that occurred the previous day. also yesterday when i fed it, there was a bit of water that had come out of the solution just sitting in the bottom, which i didn't think too much about and mixed back in. but this morning there was a bit of water just sitting on top. however it smelled nicely sour as i would imagine sourdough starter is *supposed* to smell. the freshloaf says, "It is not unusual for the mixture to get very bubbly around Day 3 or 4 and then go completely flat and appear dead." i think that may be what is happening to mine. As your starter sits or goes quiet in the refrigerator, the mixture separates and a layer of liquid will form on the top. This liquid contains about 12% to 14% alcohol. Hooch is the alcoholic byproduct of the fermentation process. The hooch will have a brownish color. NOTE: The alcohol dissipates during the baking process, Stir that liquid back into the starter before using. Hooch builds up in your starter, especially when being stored in the refrigerator.. You can either pour it off or stir it back in. If your sourdough starter is on the dry side, just mix the hooch back in. If your starter is already too moist, pour it down the drain. Important: If your sourdough starter or hooch starts looking pinkish or orange color, throw it away and start over as this means that something bad or nasty has started growing in your starter." Pinkish color is a bad thing when you do other fermented things, like sauerkraut. I think it's some kind of bacteria. I've noticed that watery separation when I've let a biga sit for a few days - never realized it could be alcoholic! prolly gonna do it like a shot before i feed it tonight! Will you be baking this weekend with it? That is some handsome bread. How did it taste? Those are really beautiful loaves! i was not able to correctly identify how much of the levain i put in there and b/c of this the loaves are at best subtly sour. i had a sandwich yesterday with salami and mustard and thought the bread tasted like normal bread. then last night i had a slice by itself and still could barely taste any acidity. however my proof times were right in the range which makes me happy about my mother culture. the crumb on the batard is a bit tighter than i would like, but it's soft and not too chewy. i guess i will update again once i cut into the boule. i guess you might be able do it with regular flour, but most of the stuff i have read calls for 'whole' forms of ground grains; either wheat or preferably rye (organic even). them yeasts be on the outsides of them grainz, yo. i dunno i got yeast from the air, it was obvious from the smell and bubbliness but it died after the second feeding. i think i just have bad luck with bread in general. milling operations are efficient in reducing the number of bacteria." 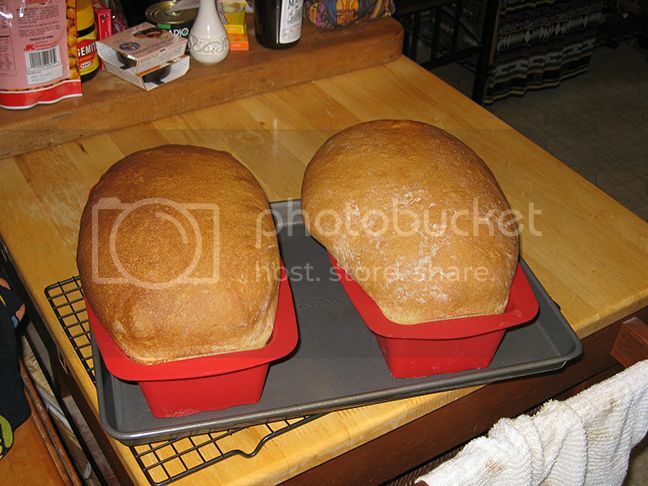 DAMN those are beautiful loaves! Your house must smell amazing. One day I will bake challah. One day. Probably not soon. Weigh an amount of it, then dry it out in the oven and weigh it again. The missing weight once it's dry is the water. I don't belong here but I got a jones to make bread. After research decided chapatis would be easiest to start with. Disaster ensues. My kitchen is covered with flour and so am I. The "breads" looked great stuck to the rolling pin I bought for this occasion but I could not get them off it looking so great. Followed a recipe, WTF. F*ck a bread, so frustrating. I will go back to my NN roots which doesn't include it. Want A+ tasty food homemade. Mad respect for all you eminent bakers, jdc A+. I will continue to admire your skillz. Thanks for showing your pro results and getting the cooking proletariat inspired to try even a little. Baking ambassador. 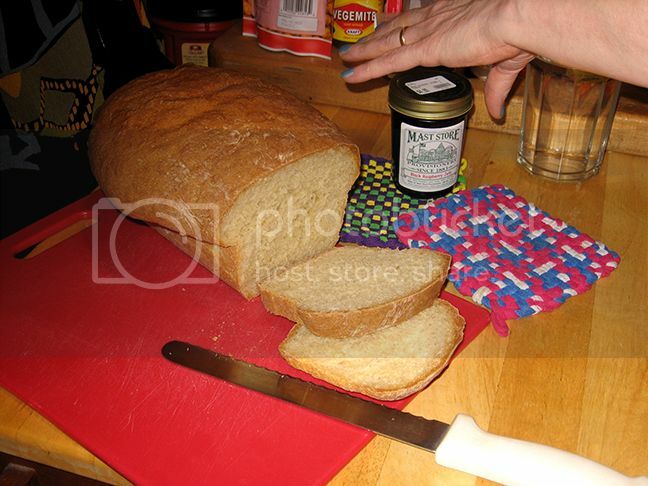 Odd that this thread gets bumped just minutes after I finished making a loaf of bread for the first time. It actually turned out really well. I made this buttermilk cluster as two loaves instead of a pan of rolls -- very nice, fine-textured crumb, better for sandwiches than the italian loaves I'd been making. And like all homemade bread, it makes great toast. How important is putting bread dough into a preheated oven? I use the oven as a proofing chamber because the kitchen stays pretty cold and the pilot light keeps the oven warm but not too hot. When it's time to bake, could I just turn on the oven without taking the dough out? I'm proofing it in the dutch oven that it bakes in. 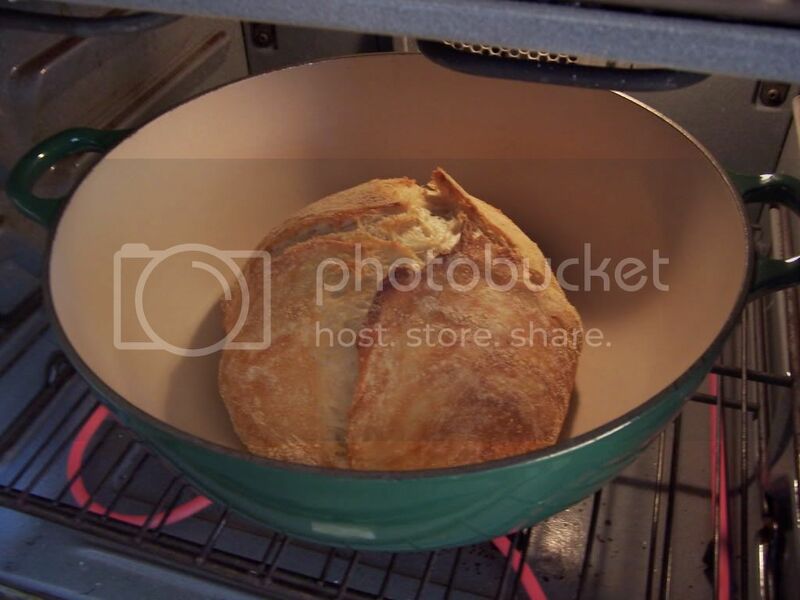 i think it ultimately depends on if the dutch oven is ceramic or cast iron --- it seems that a cold oven is suggested for ceramic receptacles/baking stones etc so that they don't crack, but if yr using cast-iron or enamelled cast-iron, you wouldn't need to do that & it may change how the bread turns out? It's enameled cast iron. It's rising very well in the oven, and I don't want to accidentally de-gas the dough with the impact of moving it around a couple of times, especially into a colder environment, so I'm going to try just turning the oven on. Thanks for that link! It depends a lot on the dough - for most, you want a hot oven so the steam/gas in the dough can puff it up before the crust forms too much. A slower oven dries out the dough more during the rising/crust forming stages, again for most. My last couple of bakes have been absolutely beautiful. Letting the preferment sit overnight was not working -- cutting back to four hours tops meant it was still very active and raring to go when I mixed the dough. Finally getting the hang of the Kitchenaid mixer. For this last batch, I had new silicone loaf pans. Got a huge oven bounce. Thanks! I'm learning that little things can mean so much -- barely warming the oiled bowl that the dough rises in, and making a slightly wetter dough. But not exhausting the preferment has been the most important lesson.